In recent years patronage on Melbourne’s rail network has skyrocketed – 94 per cent over the 12 years from 1998-99 to 2010-11. So how did all of these passengers get moved on a fleet of trains that has stayed relatively constant? Annual metropolitan train patronage peaked at 182.6 million trips in 1949-50, then went into a long decline that was not arrested until the start of the 1980s, when modern air-conditioned trains entered the fleet and the City Loop opened. In the years that followed patronage started to grow slowly, but the train fleet did not – every new train that arrived was just a one-for-one replacement for older models. Eventually the system reached breaking point, when three years of record patronage growth led to a 60-year high in passengers carried being achieved in 2007, all carried by a fleet of trains much the same size as years earlier. Despite the Victorian Government having been warned five years earlier that more trains were needed, the first of Melbourne’s additional trains didn’t enter service until December 2009, as part of an ad-hoc fleet expansion program that continues today. See the bottom of the page for an explanation for how I came up with the numbers. We start at 1999, when the Victorian Government decided to franchise the running of Melbourne’s public transport system to two private operators, each being assigned half of the network. Hillside Trains (later Connex) was allocated 57 Hitachi and 90 Comeng trains, along with the lone double deck ‘4D’ train, to operate services to the north and east of the city; while Bayside Trains (later M>Train) was allocated 58 Hitachi and 98 Comeng trains for their services in the southern and western suburbs. Under their contracts each of the private operators was required to replace their fleet of non-air conditioned Hitachi trains with brand new rolling stock. Connex replaced their 57 Hitachi trains and the orphaned ‘4D’ train with 58 X’Trapolis trains, the last of each entered service in December 2004. M>Train replaced their 58 Hitachi trains with 62 Siemens trains, which after a trouble prone entry to service, the last unit finally entered service in March 2005. 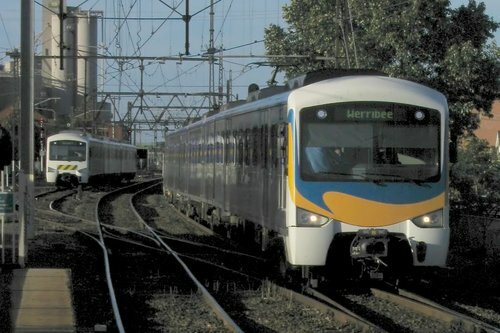 The Siemens trains were the first to expand the size of Melbourne’s train fleet: as part of their initial order M>Train included four additional trains (beyond those required to replace the Hitachis) to operate the extended suburban service to Craigieburn, which was funded in the 2002–03 state budget. The Siemens order also included an option for an additional ten 3-car trains, which was taken up by the Victorian Government in 2005. Delivered in January 2006, these trains enabled the full-time operation of 6-car trains on the Upfield line, as well as the running of additional services across the network. Altogether this gave 14 additional trains to cater for patronage growth on an expanded network. 2006 was the year that Melbourne hosted the Commonwealth Games, and it was also a year that the government promised that the new trains would have replaced the last of the non-air conditioned Hitachi trains. That never happened, with the twelve 3-carriage sets not yet scrapped were retained to cater for increasing patronage. More desperate measures followed, when in February 2007 it was revealed that the Department of Infrastructure had committed to leasing two 3-carriage Hitachi sets from a railway museum, as the government scrambled to deal with growing patronage. 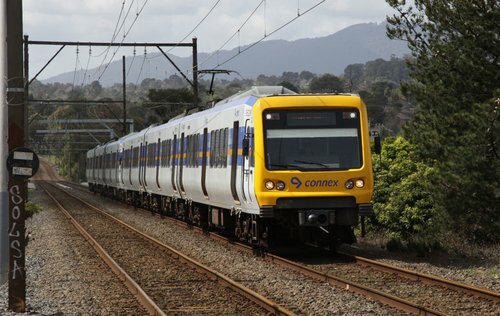 It took until July 2007 for the Victorian Government to realise they needed to buy more trains for Melbourne, when they invited Alstom and Siemens – the manufacturers of the two newest types of train on the network – to bid for a contract to supply 20 new 3-carriages trains to Melbourne. 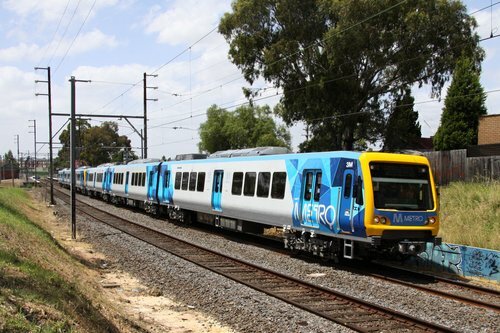 Alstom won the contract with their X’Trapolis trains, the first of which entered service in December 2009, soon after the Victorian Government had taken the credit for outing Connex and installing Metro Trains Melbourne as the new suburban rail operator. Since 2007 additional X’Trapolis trains have been ordered and entering service on a regular basis, enabling additional services to be added in each timetable revision; as well as the gradual removal from service of the last Hitachi trains, last seen in revenue service back in December 2013. As of the most recent order placed in 2013, the X’Trapolis fleet will soon number 164 3-carriage sets – just short of the Comeng fleet built back in the 1980s. It also takes Melbourne’s suburban fleet from 304 train sets back in 1999, to a total of 422 train sets. You can find the raw data and calculations used to generate the above graph in this spreadsheet: Melbourne suburban train fleet growth (1999-2015). Delivery dates were sourced from the Vicsig website by Chris Gordon. I made a number of assumptions when collecting the data, which reduces the accuracy of the graph – the main one comes from not tracking the delivery and scrapping dates of each individual train set! Instead the delivery date for each group of new trains has been taken from the delivery date of last of each group, resulting in accurate numbers only at the actual ‘census’ dates, and an unreliable estimate of fleet size between data points. In addition, I have not tracked the scrapping of the Hitachi trains, instead making the assumption that the delivery of each new train enabled the scrapping of one Hitachi, with the exception of the last 12 sets. All figures are based on 3-carriage train sets – for the past decade virtually all services use 6-carriage sets. The ‘4D’ train is actually 4 carriages long, but I count it as a single train. 1999: this start date was chosen to coincide with the change to private operation of the Melbourne suburban network. 2002: the loss of a single Comeng train was due to a fire lit by vandals. 2002/03: the decline in the Hitachi fleet to 108, then 16 and finally 12, was chosen arbitrarily – each new trains enabled the retirement of a Hitachi. The orphaned double deck ‘4D’ train spent much of the early 2000s out of service for repairs, until it was scrapped in April 2006. December 2007: a single Hitachi train was acquired from a heritage railway group. Not all seven Hitachi trains have been available for service at one time, but they remain in the spreadsheet. November 2012: a single Comeng train was damaged beyond repair in a fatal level crossing accident at Dandenong. December 2013: last recorded usage of Hitachi trains in revenue service, so I have listed them as withdrawn. I’ve excluded the 25 ‘next generation, high-capacity’ trains that were included in the March 2014 Dandenong railway line upgrade proposal – they aren’t a firm order. Last weekend, the last Hitachi service in Melbourne that was in service was vandalised! Please see the above link. That is the peril of writing blog posts in advance – new things happen and I forget to add it! Indeed it was a one-off special run by Elecrail whilst the Hitachi sets are still in the Metro Fleet but have been out of use from revenue services for some months as new trains had been delivered. I was on it and it was subject to two graffiti attacks: one near Rushall (returning from South Morang) and a second nastier incident at Essendon (returning to Craigieburn) where the vandals were abused verbally and flour bombed. They then threw a few rocks back – we were delayed there waiting for police and were quite happy to leave! I filmed much of it with a camcorder – currently editing bits of it for a YouTube post – minus any graffiti stuff! I was as passenger on the tour as well – it was interesting to say the least! Judging by your photos I was in the carriage behind you leaving Craigieburn in the morning! I moved carriages a couple of times, so who knows if I actually bumped into you! The private charter was for the farewell of the Hitachi trains by the heritage group who will keep one for posterity. I think it’s fair to count the 4D as the same as a 3-car set. It was sometimes run hooked up to a 3-car Comeng set. It’s also interesting to observe your note that most services now run as 6-car sets, with only short services (e.g. Alamein in the off-peak) running 3-cars. So the added number of trains doesn’t necessarily mean it’s all about added services, but partly about extra capacity. 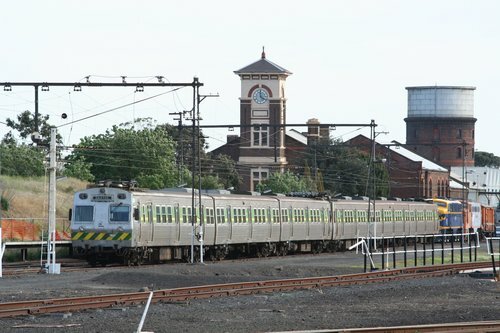 It would take some effort to run the numbers, but the number of ‘3-car set’ kilometers of service being run today would be far greater than a decade ago – once upon a time Upfield was only ever 3-car sets, as was the Werribee line off peak, and every other line on weekends outside of football season. Peak services have always been limited by the number of trains available, but in off peak times having more trains is still desirable – without them one would need to sacrifice maintenance downtime, or find a way to be more efficient at carrying it out.